Self-locking safeties are a standard feature. Solid 1" chrome plated weight horns for plate storage of both Olympic and standard weight plates. 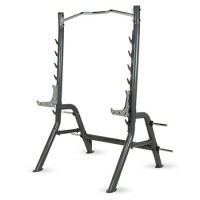 Chrome plated pull-up bar offers a variety of grip positions to target different muscle groups. 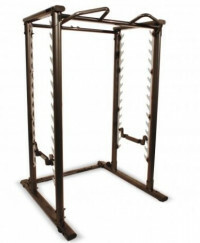 The Inspire Fitness Power Cage Squat Rack has been designed to improve the safety of free weight training. 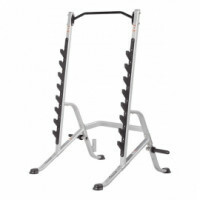 Multiple barbell catches are placed at the front and rear of the cage to catch the Barbell at any point during an exercise, whether you are training in a standing position or lying on a bench. If you miss the catches there are additional, adjustable safety bars to prevent the bar crashing to the floor or onto you. At the front of the cage is a chin up bar. 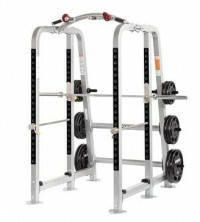 So if you love free weight training, play safe with the high quality Inspire Power Rack.